Dark current and reset anomaly are 2d additive features that effect WFCAM. All IR detectors suffer from reset anomaly to some degree or other. The main component of the reset anomaly is a large intensity ramp at one edge of each quadrant, reaching about 50 ADUs. The edge where the reset anomaly is largest is also the edge where the readout electronics is located. It has been shown that the reset anomaly ramp is stable throughout a night and even between nights for a given set of exposure parameters. The ramp is remarkably similar for a wide range of exposure times. This implies that master darks can be used to do the reset anomaly correction. However, care must be taken to reject any dark frames that are exposed right after a filter change to avoid any persistence effects. Darks are routinely computed from the daily observations, by combining as many darks taken with the same readout parameters as the object frames of interest (that is exposure time, readout mode and number of coadds). 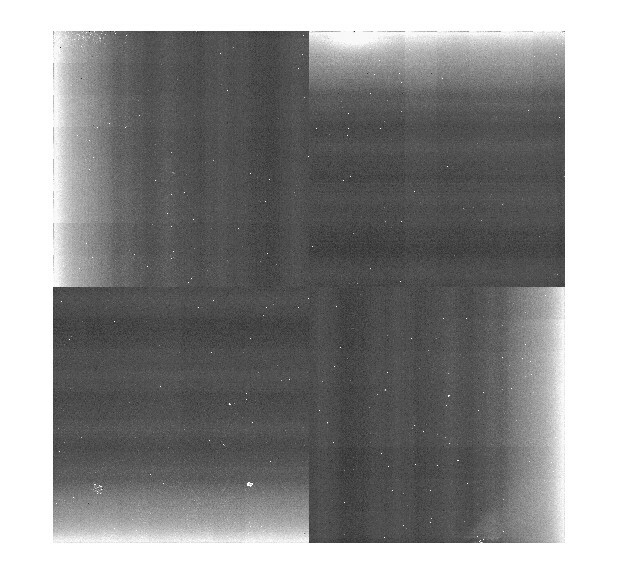 By combining many dark frames, artefacts such as cosmic rays can be elliminated from the resulting master dark. If a particular combination of parameters is not available the nearest suitable calibration dark frame from a nearby night is used instead. If this still does not produce all the required darks to process a night's data, a suitable cunning combination of closely related dark frames is created and used instead. Note that the average dark current is generally negligible and that dark frames are dominated by reset anomaly variations.